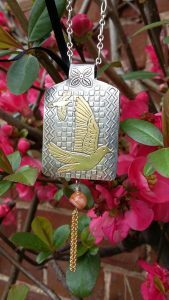 Graphic designer and jeweller, Ann Lamb, tells the story of her fundraising project to raise money for Operation Turtle Dove with the help of a collection of passionate local artists and writer. This time last year I was wholeheartedly engrossed in a fundraising project for Operation Turtle Dove. Since starting to make jewellery I have tried to design and donate a piece of my work on an annual basis to a wildlife charity. When I discovered Operation Turtle Dove I was struck by the necessity of not just raising money, but raising awareness. I still wanted to create my piece of jewellery. But it would be part of a larger project teaching people the problems facing turtle doves and how they could make a difference. The turtle dove flies through the pages of Shakespeare, the Bible and Arthurian legend. It is used as a symbol of trust, of constancy, of beauty and of love. They are the ‘herald of spring’, the ‘sound of summer’, and the gift of ‘my true love’ at Christmas. They can be found depicted in stained glass windows, jewellery shops and art galleries up and down the country. Yet scientists calculate that this golden bird, once so revered, faces the possibility of complete UK extinction as a breeding species. The decline of the turtle dove has been steep and shocking with populations falling between 1995 and 2014 by 93%. There are now just nine turtle doves for every 100 that used to thrive in the English countryside 40 years ago. It’s these dark facts which began our art-in-aid-of-nature project for turtle doves. I, along with 17 other artists and an author decided to join forces to help. 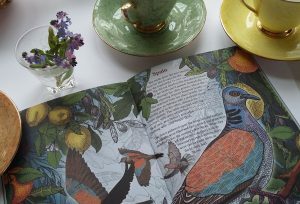 We created a beautifully written and illustrated book, and a competition with my handmade turtle dove pendant as the prize. 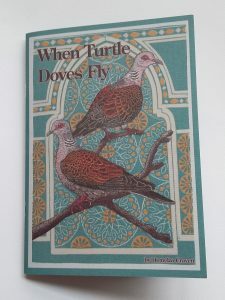 The book, ‘When Turtle Doves Fly’, tells an imagined story of turtle doves flying from England through seven countries to Mali. This route is based on an actual migration flight of one of Operation Turtle Dove’s tracked turtle doves. Also included in the book is factual information about turtle doves and advice on what we can all do to help. We also held an exhibition to showcase all of the beautiful artworks which were created for the book. We were very pleased when the Birdscapes Gallery near Holt offered to host the exhibition for us. The books are £6.50 and 100% of the profits have been donated directly to ‘Operation Turtle Dove’. The winner of our turtle dove pendant competition is a lady called Susan, who had bought her book on a visit to Pensthorpe. When I told her she’d won she was very pleased! She said that she and her husband had ‘had a lovely morning there (Pensthorpe) and spent a long time sitting quietly in the aviary where they keep turtle doves.’ She’d bought the book there as they were leaving, but it had caught her eye as soon as they’d gone in. It was wonderful to see the pendant go home with such a passionate winner. So far we have donated £1,000 to Operation Turtle Dove, from book sales by myself, friends, family and the artists involved. Birdscapes have already sent a cheque for £1,267 and I know that friends and family have also independently donated a further £200. There will probably be a bit more money to come as I still have a few books left and also from books sold at Pensthorpe and The Book Hive in Norwich which I haven’t collected yet. The turtle dove has been a symbol of hope for mankind for millennia. And now it is vital that mankind be a symbol of hope for the turtle dove. What a great shame it would be to visit a library full of books which celebrate the turtle dove as a symbol of love, hope and good faith, which has disappeared for the lack of us having any love, hope or good faith to offer them in return.